When this site was selected for a settlement in 1855, one of its founders read in an old history of the state that the Menominee Chief Tomah had at one time gathered his tribe in this vicinity for a conference. 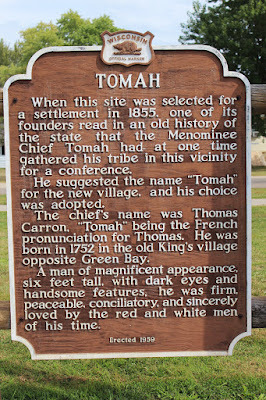 He suggested the name "Tomah" for the new village, and his choice was adopted. The chief's name was Thomas Carron, "Tomah" being the French pronunciation for Thomas. 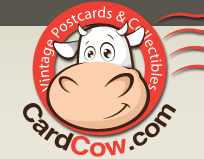 He was born in 1752 in the old King's village opposite Green Bay. A man of magnificent appearance, six feet tall, with dark eyes and handsome features, he was firm, peaceable, conciliatory, and sincerely loved by the red and white men of his time. 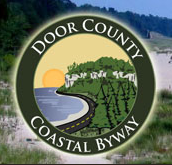 The marker is located in Butts / Memorial Park, 515 North Superior Avenue (Highway 12, Tomah, Wisconsin 54660. The marker is located in Tomah, Wisconsin.